Nashville Predators President of Hockey Operations/General Manager David Poile announced today that the club has recalled forward Miikka Salomaki (MEE-kah SA-loh-MA-kee) from Milwaukee (AHL) and placed forwards James Neal and Eric Nystrom on Injured Reserve. Salomaki, 21 (3/9/93), has 16 points (5g-11a) and 26 penalty minutes in 29 games for the Admirals this season, in addition to ranking among the AHL’s Top 10 forwards in plus/minus rating (+13). In his first North American professional season in 2013-14, the 5-11, 211-pound Raahe, Finland, native led Milwaukee in points (20g-30a-50pts) while tying for fifth among AHL rookies in points, and for seventh among first-year AHLers in assists. Nashville’s second choice, 52nd overall (second round), in the 2011 Entry Draft, has yet to appear in an NHL contest. The Nashville Predators, who have gained points in nine of their last 10 games to take over first place in the Central Division, play the division rival Dallas Stars on home ice tonight at 7 p.m. CT (Fox Sports Tennessee, 102.5 The Game). 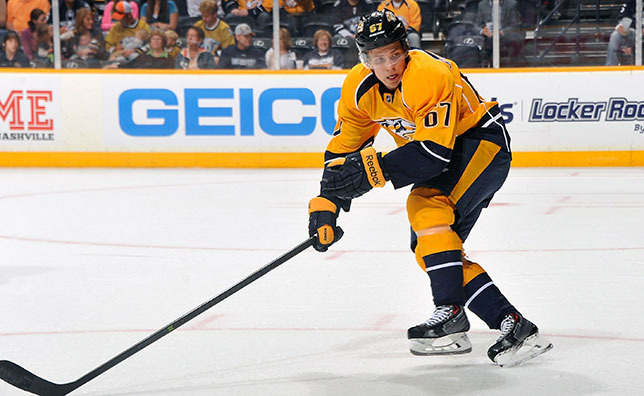 Nashville will travel to Minnesota on Saturday for its second consecutive divisional matchup (1 p.m. CT, Fox Sports Tennessee, 102.5 The Game), before returning to Bridgestone Arena’s friendly confines on Tuesday, Jan. 13 versus Vancouver. Students are invited to take advantage of the “Jack in the Box” Student Rush ticket special for tonight’s game against the Stars. Available at the Bridgestone Arena Box Office with any student ID, students receive a lower-level ticket, a coupon for a free breakfast burrito and a t-shirt for $35. A limited number of tickets still remain, call 615-770-7800 for more information.